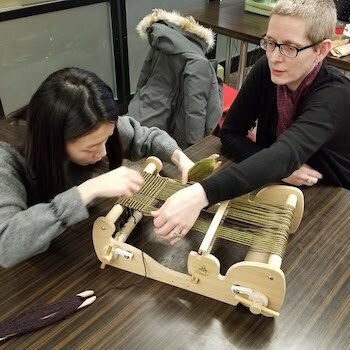 The Laurier Library has is pleased to announce Maker Mondays, a new series of meet-ups in its beta makerspace facility located in the Waterloo campus Library. Every Monday from 1-4:30 p.m., Laurier students, staff, faculty and friends are invited to drop by the nascent makerspace, located on the main floor of the Library building, to chat with us about maker culture and to do some hands-on tinkering with our 3D printer, sewing machine, and other cool tools and gadgetry. “Bring your projects, ideas, questions and curiosity to this unstructured meet-up, which is the heartbeat of the effort. If you can't make it this week, come next week,” said Darin White, the Library’s communications and cultural programming associate and its resident maker-at-large. The makerspace – funded in part by a generous contribution from Laurier’s Student Life Levy – is accessible to students, staff, faculty and members of the broader community. The Library is developing the space using an “open beta” approach, in which facilities and programs are being designed iteratively through a process of engagement with the community. The team is taking the same consultative approach to naming the space, and is currently soliciting suggestions. The Library makerspace is one of several such facilities popping up on Laurier campuses, most of which are geared to specific faculties or departments. A makerspace is a place in which people with shared interests in making things – notably in computing or technology and also in creative areas such as arts and crafts, clothing design, instrument building and book binding – can gather to work on projects while sharing ideas, equipment and knowledge. To learn more about this emerging facility and/or to suggest a name for the space, drop by a Maker Monday session or contact Darin White at dawhite@wlu.ca or 519.884.0710 x4973.